In the 1970s and 80s the NHS treated haemophiliacs with a contaminated blood clotting product (‘Factorate’). More than 4,600 were infected with Hepatitis C and HIV. Over 2,900 have since died. The public enquiry opens on September 24th 2018. 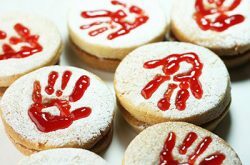 These ‘Jammie Truth Dodgers’ showing ‘Blood on their hands’ were made by Louisa Paintin, the daughter of one of the victims.